This year we decided to step things up a bit and do a little fancier of an e-card. Plus, we will email this card to all active master accounts. Through the magic of computers (err, Photoshop) Joel was able to join us, even though he works several states away. 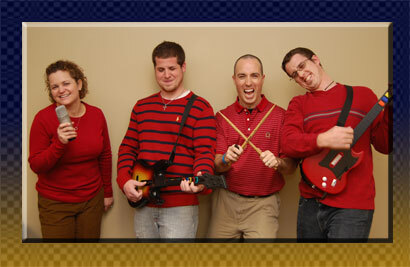 I have also also included a second picture showing our passion when it comes to WorshipPlanning.com. We all just want you to know how much we appreciate your support, encouragement, and feedback for this little worshipplanning.com ministry. We all so very much enjoy the chance we have to serve you and Christ. 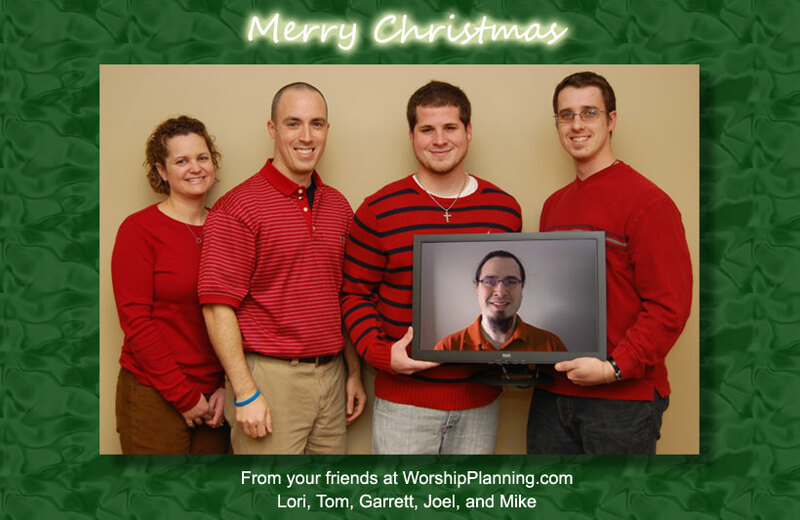 Things are on track for 2010 to be an exciting year as we continue to add more resources to expand WorshipPlanning.com’s features and market presence. Just to mention a few, we are actively working on native smartphone versions for WP, an improved user interface experience for Helpers, more drag-n-drop capabilities for the worship flow construction, and greatly improved 360WP. Thank you for a wonderful 2009! Merry Christmas!! Christmas Eve Service Like Last Year’s? I recently got a question from a worship leader asking if there is an easy way to build a worship flow that is identical to a service they did last year. In this case, he was talking about a Christmas Eve service, but the answer could be useful year round. 1) Get to the worship flow of the service from last year (Admin >> Services >> “show past and future services” link >> right-arrow next to desired service). 2) On the service flow page, open the “Menu Options” panel on the left side, then the “Copy This Service” link. 3) On the Copy Service page, select to either clone the service (if you haven’t created the new service in WP), or simply copy the worship elements (called “Activities”) to a service you have already scheduled. If you think the worship flow might be worthy, you could also create a “template” from it that you could use in the future. Learn more about service templates on our Video Tutorial page (http://support.worshipplanning.com/tutorials.cfm – near the bottom). As promised, we have added a few helpful items to Worship Planning support, both on our support site (http://support.worshipplanning.com) and within the main and My WP sites. All have centered around video tutorial improvements. In the main and My WP sites, we have broken down many of the large (8+ minute) videos to shorter ones that allow you to jump straight to the “how to” information you need. This is especially helpful for new team leaders and volunteers as they try to figure things out. On the Support site, the tutorial page shows a complete listing of all the videos. But, we have also created video “tracks” that allow Helpers and Planners easily walk through a set of videos to learn about certainly functionality of the site. Right now we have only 3 tracks, but we will certainly be adding more. Also, when you perform a search on the support site, the results now include a list of relevant videos that you might find helpful. Our goal is to make it very easy for everyone, including team leaders and volunteers, to use the site. Got feedback on how? Post a comment and let us know! As before, Planners with a high enough security level can change the availability of Helpers and other Planners. But we have also added to the Teams page an “availability” tab that displays a calendar of dates/times/services blocked by team members. Only team leaders have access to see their team’s availability calendar. Team leaders also have the ability to change the availability of their team members, regardless of security level. In the next few days, we plan on adding some enhancements to our support pages, as well as more video tutorials to assist team leaders and helpers with using the site. That will probably be our last enhancement update until the new year. With Christmas just a few weeks away, we want to avoid the risk of creating new bugs or issues with the site. We continue to develop a mobile version of WP that will be a native app for iPhone, Blackberry, Windows Mobile, Android, and Symbian devices. We also are working on some exciting improvements to the Songs Library and Worship Flow pages. Stay tuned for more info….